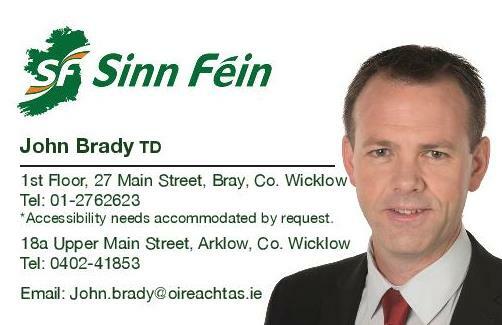 Sinn Féin TD for Wicklow/East Carlow John Brady has called for an investigation into the State’s handling of the sale of Ardmore Studios in Bray. “The Government’s approach to the sale of Ardmore Studios has been one of mismanagement and suspicion. On the one hand, the State is assisting the development of Troy Studios in Limerick, which will be in direct competition with Ardmore, whilst on the other hand the State is undermining the film industry in Bray. “The Government were slow in coming out after the announcement that Ardmore Studios was to be sold as a going concern back in October and as of yet a firm commitment on Ardmore Studios remaining as it is in Bray as an absolute necessity has not been made. “It appears that the Prospectus for the sale of Ardmore Studios has been leaked to RTÉ and it is now known that within the Prospectus, the potential development of the 18 acre site for residential purposes is included. I must reiterate that no residential development will be allowed to take place on this site and that any development here must only be further expansion of the television and film industry already there. “I have written to the Minister for Jobs, Enterprise & Innovation Mary Mitchell O’Connor and the Minister for Arts, Heritage, Regional, Rural and Gaeltacht Affairs Heather Humphreys requesting the Prospectus on more than one occasion. I again requested it directly with Minister Mitchell O’Connor at a recent meeting however, all to no avail. “It also needs to remembered that there are hundreds of workers who have been left in limbo and are now waiting on the State to respond to this situation. “I am calling on the Taoiseach, on behalf of the Government, to make a public announcement as to the State’s commitment to the future of Ardmore Studios in Bray. The Taoiseach also needs to commit to veto any sale that would not be in the best interest of Ardmore Studios in its present form in Bray. “Now that the Prospectus and its contents are already in the public domain it needs to be made available to public representatives and I call on the Taoiseach to make this happen immediately.